In this case, root development (biologic eruption status), tooth position, and physical obstruction (radiographically evident or not) should be evaluated. In the absence of ectopic tooth position and physical obstruction, and if the biologic eruption status is within normal limits, periodic observation is the recommended course of action. For a succedaneous tooth if root formation is inadequate, extraction of the deciduous tooth or exposure to apply active orthodontic treatment is not justified. Root development should be followed by periodic radiographic examination. If the tooth is lagging in its eruption status, active treatment is recommended when more than 2/3 of the root has developed. Radiographic examination might also show an ectopic position of the developing tooth. 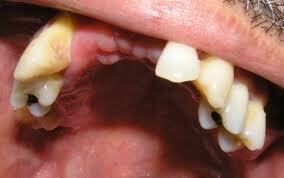 Often, some deviations self-correct, but significant migration of the tooth usually requires extraction. If self-correction is not observed over time, active treatment should begin. Exposure accompanied by orthodontic traction has been shown to be successful. In patients in whom the ectopic teeth deviate more than 90° from the normal eruptive path, autotransplantation might be an effective alternative. An obstruction causing delayed eruption might or might not be obvious on the radiographic survey. A soft tissue barrier to eruption is not discernible on the radiograph, but, regardless of etiology, an obstruction should be treated with an uncovering procedure that includes enamel exposure. Supernumerary teeth, tumors, cysts, and bony sequestra are examples of physical obstructions visible on the radiographic survey. Their removal usually will permit the affected tooth to erupt. In the deciduous dentition, DTE due to obstruction is uncommon, but scar tissue (due to trauma) and pericoronal odontogenic cysts or neoplasms are the usual culprits in cases of obstruction. Trauma is more common in the anterior region, but cysts or neoplasms are more likely to result in DTE in the canine and molar regions.Odontomas are reported to be the most common of the odontogenic lesions associated with DTE. Treatment options for deciduous DTE range from observation, removal of physical obstruction with and without exposure of the affected tooth, orthodontic traction on rare occasions, and extraction of the involved tooth. In the permanent dentition, removal of the physical obstruction from the path of eruption is recommended. When neoplasms (odontogenic or nonodontogenic) cause obstruction, the surgical approach is dictated by the biologic behavior of the lesion. 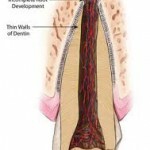 If the affected tooth is deep in the bone, the follicle around it should be left intact. When the affected tooth is in a superficial position, exposure of the enamel is done at tumor removal. Occasionally, the affected tooth must be removed. Four surgical approaches have been recommended for uncovering impacted teeth. These include gingivectomy, apically positioned flap, flap/ closed eruption, and the preorthodontic uncovering technique. Two opinions seems to exist regarding management of the tooth delayed in eruption after removing the physical barrier. McDonald and Avery recommend exposure of the tooth delayed in eruption at the surgical removal of the barrier, but Houston and Tulley advocate removing the obstruction and providing sufficient space for the unerupted tooth to erupt spontaneously. Most teeth (54%-75%) erupt spontaneously in the latter situation; however, the eruption rate might be protracted. DiBiase reported that if the tooth is not displaced and its follicle not disturbed during the surgical procedure, the tooth might take an average of 18 months to erupt. DiBiase also stated that sufficient space should be made available for the tooth’s eruption. If the tooth is exposed at the time of surgery, it might or might not be subjected to orthodontic traction to accelerate and guide its eruption into the arch. The decision to use orthodontic traction in most case reports seems to be a judgment call for the clinician. No conclusive guidelines could be derived from the literature regarding when active force should be used to aid eruption of the exposed tooth. 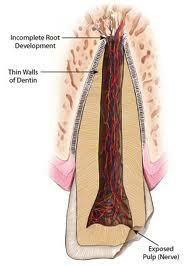 Occasionally, a deciduous tooth can be a physical barrier to the eruption of the succedaneous tooth. In most cases, removing the deciduous tooth will allow for spontaneous eruption of the successor. When archlength deficiency creates a physical obstruction, either expansion of the dental arches or extraction might be necessary to obtain the required space. Extraction of either the affected or adjacent teeth can be performed. Occasionally, several teeth in a quadrant might be unerupted, and this can present an orthodontic challenge because of the lack of adequate anchorage elements. Osseointegrated implants might offer viable alternatives for anchorage in such cases. Whenever DTE is generalized, the patient should be examined for systemic diseases affecting eruption, such as endocrine disorders, organ failures, metabolic disorders, drugs, and inherited and genetic disorders. Various methods have been suggested for treating eruption disorders in these conditions. These include no treatment (observation), elimination of obstacles to eruption (eg, cysts, soft tissue overgrowths), exposure of affected teeth with and without orthodontic traction, autotransplantation, and control of the systemic disease. Variation in the normal eruption of teeth is a common finding, but significant deviations from established norms should alert the clinician to further investigate the patient’s health and development. Delayed tooth eruption might be a harbinger of a systemic condition or an indication of altered physiology of the craniofacial complex. Orthodontists are often in a sentry position to perform an early evaluation of craniofacial structures, both clinically and radiographically. Proper evaluation of DTE in orthodontic diagnosis and treatment requires a clear definition of the term and its significance. We propose a diagnostic “tree” that would enable the clinician to perform an accurate and thorough orthodontic diagnosis of the patient with DTE.